Extreme wear and tear requirements nowadays demand efficient and reliable materials. 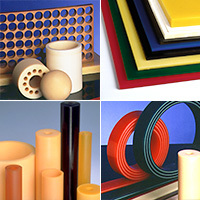 High grade polyurethane elastomers with their unique possibilities of variation stand up to these requirements in an ideal way. A precondition for this are however a comprehensive knowledge in compounds and processing methods in order to use the full potential of the various polyurethane grades for each application. Polyurethane and polyurethane is not the same. Even if the basic compounds (among others Desmodur 15 or Vulkollan) are identical the properties of a polyurethane elastomer are mainly influenced by special additives, for example for elasticity, thermal stability, resistance against hydrolysis and processing know how. more than 60 standard PUR compounds adapted to specific requirements.